On the 22nd February the Conservative administration signed a 25 year contract with Urbaser Balfour Beatty (UBB) to build a 190,000 tonnes per year waste incinerator at Javelin Park. One month later (21st March) the county council’s planning committee unanimously refused planning permission. This council notes the decision made by the recent Planning Committee to reject the planning application to build a waste incinerator at Javelin Park. This council therefore calls on the Chief Executive to seek robust support to defend the unanimous Planning Committee decision in any appeal process that may take place in the future. This Council should immediately establish a “Plan B” cross-party working group to consider alternatives to the current proposals for a waste incinerator at Javelin Park, to be available in the event that the council’s current contract proposal with UBB ultimately fails. 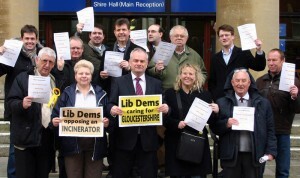 Stop work on the incinerator! The county council must stop work on the waste incinerator project until after the elections, when a new administration can give fresh instructions to council officers. That is the view of the Liberal Democrat group. Following the decision of the planning committee to refuse planning permission for a £500m waste incinerator at Javelin Park, Liberal Democrat leader Cllr. Jeremy Hilton has written to the chief executive of Gloucestershire County Council requesting work on the project to be halted. Jeremy Hilton has also asked for confirmation on whether or not the contract between the county council and Urbaser Balfour Beatty has been signed. Cllr. Jeremy Hilton said: “The planning committee has spoken; in my view the plan to build a mass burn incinerator at Javelin Park should be stopped until after the elections on May 2nd, when a new administration can give fresh instructions to council officers to progress alternative plans. In a letter to the chief executive, Cllr. Hilton requested that no further work be done on the waste incinerator project until new administration was in place. He also asked the council to request UBB from not proceeding with a planning appeal. Cllr. Simon Wheeler a member of the planning committee said: “The committee came to the only honest conclusion it could in the face of overwhelming argument by members of the public. As a councillor I represent first the wishes of the public. The development conflicts with several development plan policies and whilst WCS14, Structure Plan Policy NHE1, and Stroud District Local Plan Policy NE10 recognise the potential for other public (including social, environmental, and economic) benefits to outweigh harm to the landscape, it is considered as a matter of planning judgement the identified harm is not outweighed by those considerations. The form of the development will introduce a prominent building causing significant loss of the open character and the natural rural appearance to this part of the Severn Vale contrary to WCS Policy 14, WLP Policy 37, Stroud District Local Plan Policy NE10 and paragraph 109 of the NPPF in term of the effect on the intrinsic character of the countryside and Structure Plan Policies NHE1 and S6 (a). The development is outside the Cotswold AONB and views from it including from the Cotswold Way would be generally against the backdrop of the Severn Vale which includes other building development. It is considered that there would be some visual impact which would affect the noted special qualities of the area. We agree with Natural England that significant adverse impacts of the proposal are not outweighed by other considerations. Therefore, as a matter of judgment it is considered that there would be significant harm to the overall setting of the AONB and long distance views. The proposed mitigation measures in the layout and design of the EfW do not overcome this harm contrary to Policy WCS14. The development would lead to harm to the significance of designated heritage assets and that harm is not outweighed by the public benefits of the proposal contrary to Policy WCS16 and Paragraph 134 of the NPPF. Notwithstanding the proposed mitigation, the proposed development would have an overbearing effect on nearby residential properties adversely affecting amenity contrary to WLP Policy 37 and Stroud District Local Plan Policy GE1.